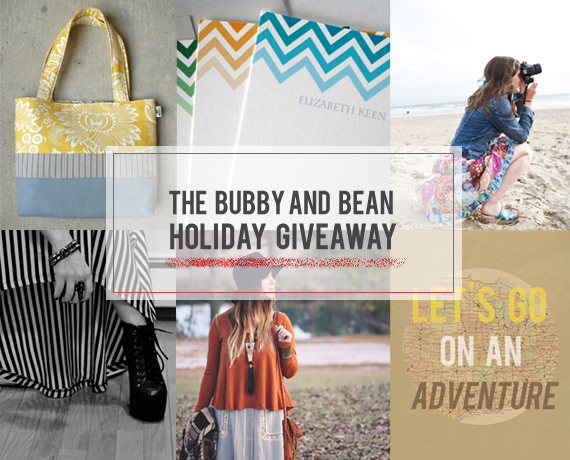 Bubby and Bean ::: Living Creatively: Holiday GIVEAWAY // Win a Prize Package Worth $270! Holiday GIVEAWAY // Win a Prize Package Worth $270! Greetings from Mexico! Sitting here in the sunshine with the ocean just a few feet away, it's hard to believe that Christmas is one week from tomorrow! Whether you're surrounded by chilly winds and snow or basking in the sun somewhere warm, we want you guys to have the best holiday ever. So we've rounded up a whole bunch of incredible prizes from several of our magic elves (also known as our amazing December sponsors), as well as something special from Bubby and Bean Art. These fantastic goodies all come from handmade + independent shops and blogs: accessories, art, greeting cards, an e-course and coaching call, and blog ad space. And one lucky Bubby and Bean reader will win all 6 prizes, valued at nearly $270! Then just leave a comment telling me your favorite thing about the holiday season! Visit any of the shops from this giveaway (Row House 14 // Sew Beastly // Roots & Feathers // Rebecca Murphy // Little Tree Vintage // Bubby & Bean Art) and list your favorite item(s). Follow/subscribe to any of the blogs from this giveaway (Little Tree // Row House 14 // Roots & Feathers // Rebecca Murphy // Sew Beastly). This giveaway is open through December 24th (Christmas Eve!). The winner's name will be chosen randomly and announced soon shortly after. Good luck, and HAPPY HOLIDAYS! I follow via twitter (@eliserab)! I follow via Instagram (@eliserab)! Love this giveaway! My favorite thing about the holiday season is eating delicious food with family and friends! What a great giveaway! I am loving all of the holiday cheer that is being spread throughout the blogging world for the holidays! It is getting me even more excited for Christmas! I love Christmas gift shopping! My favourite thing about the holidays ... the smells. The smell of my tree. The smell of cookies in the oven. The smell of hot chocolate. The smell of apple cider. I just love all of the smells. They are just so Christmasy. I follow Little Tree Vintage with GFC. I love Row House's recipe cards with all of the veggies drawn on the bottom. They're so cute and perfect. On Sew Beasley, I love the scrappy blue tote in sunburst. It would be a perfect bag for running a few errands or heading to the beach. In the Roots and Feathers store, I love the jada jewel toned beaded earrings. They're the perfect length and colours. I really like the SCRAPPY TOTE IN BLUE SUNBURST from Sew Beastly. My favorite thing is baking baking baking! My favorite thing about the holiday season is being with family. My favorite thing about xmas is being able to give to my friends and family! My favorite thing about the holiday season is the smell! Cinnamon, pine and fresh baked cookies just gets me in the holiday season. Music isn't too far behind. Great giveaway, thank you! My favorite thing about the holidays is getting together with friends and families! Bubbly and beans shop is on vacation..
My favorite thing about the holiday season is getting together to spend time with friends and family! My favorite thing about holiday season is egg nog ! Yummy ! My favorite thing about the holiday season is getting together with friends and family! I follow Bubby and Bean on Pinterest. 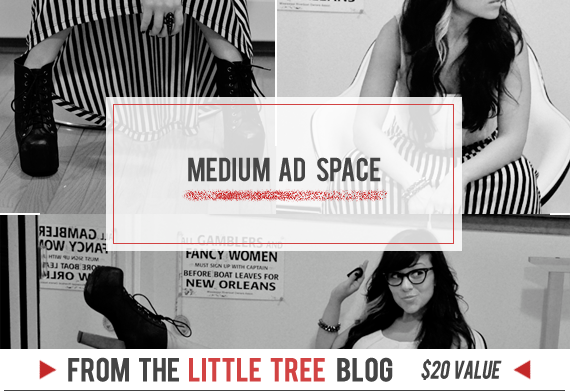 I am now following The Little Tree Vintage via GFC. I love the big family party! The food! And the gift! New follower :) I love everything about christmas, the tree, having the house decorated and spending time with family! My favorite holidays thing is our family gathering! Followed Bubby & Bean on Bloglovin'! Followed you on Pinterest as Chestnut Mocha! Liked Bubby & Bean on Facebook as Chestnut Mocha! Followed you on Twitter as @chestnutmocha! I love making new holiday memories with my 3 month old son! 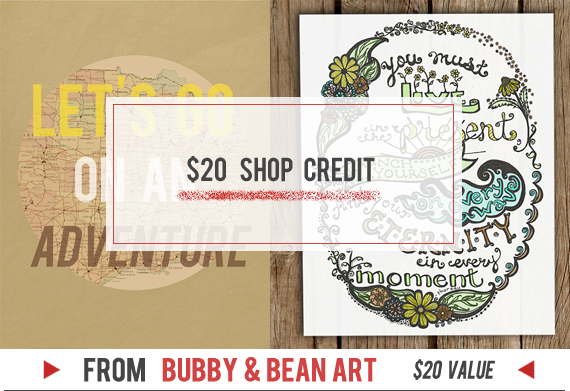 LOVE Bubby & Bean Art's poster "Let's Go On An Adventure!" I love all things maps!! I follow Bubby & Bean on Twitter! My favorite thing about the holidays is getting to see lots of people that I care about! My favorite thing about the holiday season is buying gifts for my friends and family. Roots & Feathers = zara. a pair of black wooden leaf earrings. I follow Roots and Feathers via GFC. 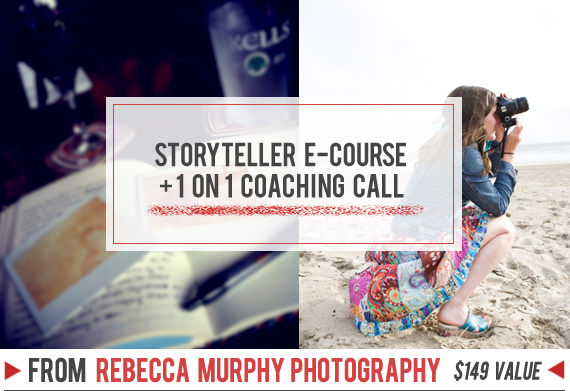 I follow Rebecca Murphy's blog via e-mail. I follow Sew Beastly via GFC. I follow Bubby and Bean via Bloglovin'. I follow you on Pinterest (Suzanne Gregg/houseofplush). I like Bubby and Bean on FB as Suzanne Gregg. I follow you on Instagram @kiddomerriweather. I *love* the jade. 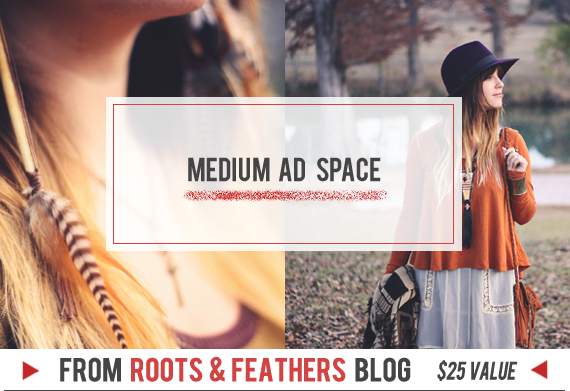 a bohemian necklace made of leather, stone, textile and a rusty key - from Roots and Feathers. Rebecca Murphy's Love- Silver Hand Stamped Pendant Necklace is my fav! How sweet is the Vintage Birdcage Sweetheart Necklace from Little Tree Vintage!!! I love this time to just celebrate Jesus even more than normal! :) I follow on Bloglovin! I love the foldover leather clutch in brown ikat!! Following on Bloglovin' as well as GFC! 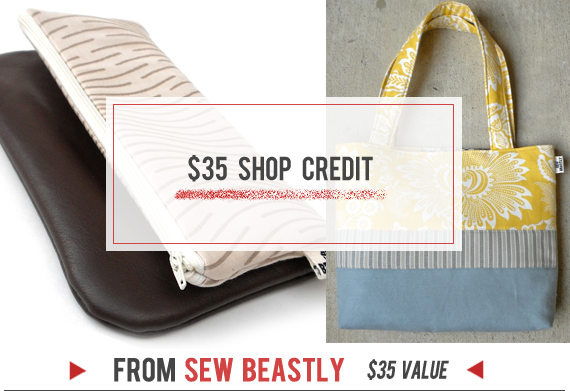 following Sew Beastly on GFC! My favorite thing about the holidays is playing board games with my family! I follow Row House 14 on GFC. ..also following Little Tree viz GFC! Following Roots and Feathers via GFC as well! I follow Bubby & Bean on bloglovin' and truly enjoy getting updates on new posts! My favorite thing about the holidays is seeing my friends that I only see once a year. I love them! My favorite thing about this holiday season is going to be us being together as a family! We've been in transition & moving for the past month and I'm looking forward to a peaceful Christmas after all of the chaos. 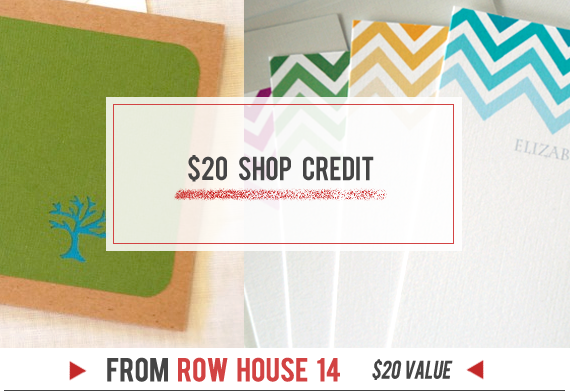 I love the personalize arts & crafts note card set from Row House 14. I love the small ruffled clutch in partly sunny from Sew Beastly. I love the You Must Live in the Present print from your shop! I follow Row House 14's blog. I follow Sew Beastly's blog. I love the zara earrings from Roots and Feathers. I love the Sweet Ruby Reds shoes from For the Love of Vintage. My favorite item is gizelle. a tribal inspired statement bird necklace from RootsandFeathers. I followed Bubby & Bean on Bloglovin'. I liked Bubby & Bean on Facebook.